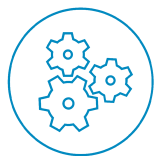 Configuration Management: It’s now possible to have many components in one IBM Rational DOORS Next Generation (DOORS NG) or Rational Quality Manager (RQM) project area (“fine-grained components”), each component having its own streams and baselines. This will help in Strategic Reuse and parallel development scenarios. Also, Design Management now matches DOORS NG’s optional control over streams (for example, requiring an approved change request before delivery). Easier, more expressive reporting: More graphing options and more kinds of data are now available for reporting with Jazz Reporting Service Report Builder. Also it’s easier and faster to build cross-lifecycle views in Rational Engineering Lifecycle Manager (RELM) with the new links wizard and other usability improvements. Scaled Agile Framework®: It’s easier than ever to make agile practices more applicable to the development of applications, products and devices. SAFe® 4.0 process templates (including built-in live process guidance) are now available when creating a new SAFe project area in Rational Team Concert (RTC), RQM, and DOORS NG. And additional advanced SAFe reports are available for download from jazz.net/safe. Jazz source control: Developers can be more productive with undo merge, easier search for baselines, using a favorite external merge tool in more places such as when auto-resolving conflicts, keep existing time stamps on load operations, and more. And you can now report on RTC SCM data such as change sets and file-id versions and export this information for further processing and reporting. Tracking and Planning: It’s easier to express yourself now that work items include rich text in the web, Eclipse and Visual Studio clients. And it’s easier to get started with Tracking and Planning when moving your existing defects and stories to RTC with a new web based CSV file importer that enables you to preview changes before you commit them. Requirements Management: It’s now easier to navigate and search with more space on the screen for normal work and complex functions less distracting for the typical user. We’ve retired the “RRCx” Java plug-ins for your web browser: no more Java plug-in hassles! The diagram editor now includes a UI wireframe palette, making it easy to mock up screens, include them in requirements documents or collections, and review, link and baseline them. Quality Management: Manual testers will like the new customizations for manual test scripts and steps. Reuse of categories across various kinds of testing artifacts reduces manual duplication and maintenance of this information. Drag-and-drop now works within RQM, for example, to associate a test case with a particular test plan. And now you can finish test runs faster when you configure your automated tests to run across multiple machines. Design Management: Now with one click you can go from viewing models on the web to editing them in IBM Rational Rhapsody Design Manager, among other usability improvements. Improved line routing in Rational Rhapsody makes for cleaner, better looking diagrams with less manual tweaking of diagram element placement. In addition Rational Publishing Engine 2.1.1 is now available and worth your attention for creating template-based documents from IBM Rational and other data sources. Team members can generate new documents directly from the RPE Document Builder with a few simple mouse clicks. It’s now easier for the team to be more aware of existing report templates and generated shared documents, which should help teams to reuse rather than recreate things already exist. New Java MBeans supply additional data for server monitoring. It’s now possible to administratively manage more expensive user scenarios, which can enable more consistent system performance. JRS Data Collection Component (DCC) can be used to load large sets of DOORS data into the data warehouse faster and more often, meaning data can be fresher for practitioners. Using RPE Document Builder, administrators can now monitor long running RPE jobs and pause, cancel, or resume them. I’ve only mentioned a portion of the many excellent improvements in these releases. You can read more in the New and Noteworthy pages (see links above). New users can try CLM in the cloud or CE in the cloud here on jazz.net without having to download and install anything. If you are looking for CLM or CE in the cloud for your own teams’ use, check it out here. You can learn more about Rhapsody 8.2 enhancements here. We’ll be publishing more specific “what’s new” topics daily. They’re linked below for your convenience.